When & How Can You Tell If A Kitten Has Cerebellar Hypoplasia? Imagine this: Suddenly you’re taking care of a litter of tiny kittens. Most seem fine, but one or several seem a bit… off. For those in the know, diagnosing cerebellar hypoplasia in kittens may be rather easy. But for those unfamiliar with the condition, it’s understandable if they’re concerned about these wobbly cats. Either way, here are some things you should look for and when. As those familiar with cerebellar hypoplasia know, CH has two main characteristics: wobbly or unsteady walking and head tremors. Both of these can vary greatly from cat to cat, so it’s not uncommon for litter mates to exhibit different abilities. Some may be able to walk with difficulty, others may not be able to walk at all. 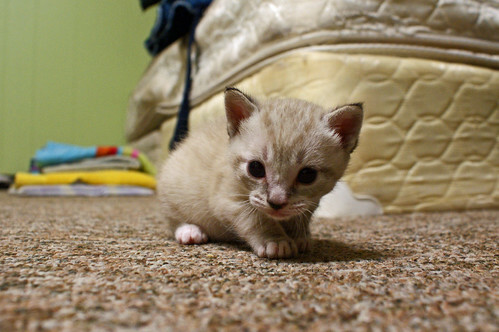 Kittens will normally begin to walk when they’re about 5-weeks-old, but they may not excel at it until they’re 7-weeks-old. That said, every CH cat is different, so your CH cat may not be able to walk or stand until she’s a few months old. But that will be a cue that there’s something going on with the kitten. If you’re taking care of multiple kittens, watch them and track their abilities for comparison. If you have one kitten, watch his progress closely. Look for attempts to get up that are prevented by wobbling, tumbling, rolling over on his side. Play with the kitten and watch his head movements. Head tremors, or wobbles from side to side like a bobble head, are another characteristic of CH. Their heads will most often tremor when they’re focusing on something. CH kittens may also have trouble using the litter box. They may not be able to step into it, and may tumble out. Fortunately, there are alternatives you can consider until your kitten can manage. If you’re new to CH, don’t worry. The kitten isn’t in pain, he may simply need a little extra help. They make excellent pets, and you can read about some of their inspirational stories here. 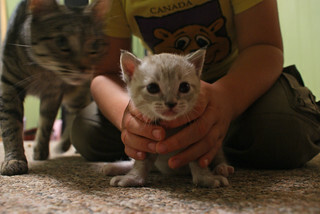 During this time in the kitten’s development, you may be bringing him to the vet for check-ups and vaccinations. If you think a kitten has cerebellar hypoplasia, bring it up with your vet. Veterinarians who are familiar with CH can usually diagnose it after observing your cat. While there are ways to officially diagnose CH, such as an MRI, most owners opt not to do this unless they fear there’s another issue.